The Toronto Raptors, the first-place team in the Eastern Conference, lost last night, to the third-place Cleveland Cavaliers. They lost to the badly depleted second-place Boston Celtics three nights prior. They’ve lost five of their last eight games, the worst stretch in what’s so far been the best season in the history of the franchise. They’re withering in April, and it sure as hell feels like I’ve seen this show before. This didn’t register as a disappointment at the time: Most early-season observers hadn’t expected the Raptors to accomplish even that much. They came into the 2014-15 season with higher expectations, and mostly rose to meet them. They bested the previous year’s franchise record for wins by a single game on the season’s last day, and claimed the East’s fourth seed and a first-round matchup against the Washington Wizards, whom they’d swept in the regular season. Maybe you don’t remember how that went... but I sure as hell do, baby! The Wizards swept the Raptors in bizarrely thorough fashion, finishing the series with an aggregate 56-point margin of victory: After an overtime thriller in Game 1, the following three games featured a grand total of maybe 15 minutes of uncertainty as to who’d be advancing, and Game 4 was a 31-point laugher in which the Raptors all but disbanded on the court. Lowry, who’d made his first all-star appearance earlier that season, finished the series with as many personal fouls (20) as made field goals. It’s one of the most baffling NBA playoff series I can remember. 2016 stands out now as an aberration: The Raptors once again set a franchise record for regular-season wins, with 56, and entered the playoffs as the East’s second seed—only this time, they won Game 7s in the first and second rounds to advance to the conference final for the first time in their history. Even this run came with some now-familiar springtime wobbliness, though: The Raptors lost the first game of each of their three series, the first two of them at home, keeping alive the Lowry-DeRozan Raptors’ streak of losing the first game of every playoff series they’d ever been in. And then of course it ended with a baffling collapse, a 26-point beatdown on their home floor in the sixth and final game of the Cavaliers series. The Raptors did not set a new franchise record for wins last season; their 51-31 record represented the first time in six years that they hadn’t improved on the previous season’s win total. They kept up that other tradition, though, losing Game 1 of the first round, on their home floor, to the lower-seeded Milwaukee Bucks. They rallied from that, and got past the Bucks in what turned out to be a fairly one-sided six-game series. And then the Cavaliers swept them directly into hell—by a combined 61 goddamn points!—in the second round. Which brings us to the present season, the fourth in the past five years with a plausible claim to being their best ever. The Raptors need only win two of their final five games to set a new record for regular-season wins; any combination of four Raptors wins and Celtics losses will clinch them the franchise’s first top playoff seed. They’re the deepest team in the East and possibly in the entire NBA, an endlessly reconfigurable assortment of long, rangy, and multifarious athletes who fly all over the place, bomb threes, and defend like hell. All season long they’ve been the healthiest, stablest, and most balanced of the East’s playoff contending teams. Lowry and DeRozan each made their fourth all-star teams; DeRozan added a three-point shot to his game and blossomed into a genuine MVP candidate. The Celtics cycled half their roster through their local surgical center; the Cavaliers just straight up traded half theirs away at the deadline; the Bucks, Wizards, and Heat foundered and flopped around like the shitbrains they are; the Sixers and Pacers bounced up and down in the standings in time to their young stars’ growing pains; the Raptors just won and won and won. The East has been theirs for the taking for months. And now, in the season’s last couple weeks, they’re suddenly on the verge of giving it away. The NBA’s official play-by-play records this as “MISS Lowry 2' floating jump shot” which is both accurate and inaccurate in equal and equally hilarious measure. Longtime Raptors observer Eric Koreen, writing for The Athletic (subscription required), flags this as perhaps uncomfortably reminiscent of the time in 2001 when Vince Carter, at the time the biggest star the franchise ever had, traveled to North Carolina to walk in his college graduation ceremony and receive his degree the morning before Game 7 of a second-round series against the top seeded Philadelphia 76ers. 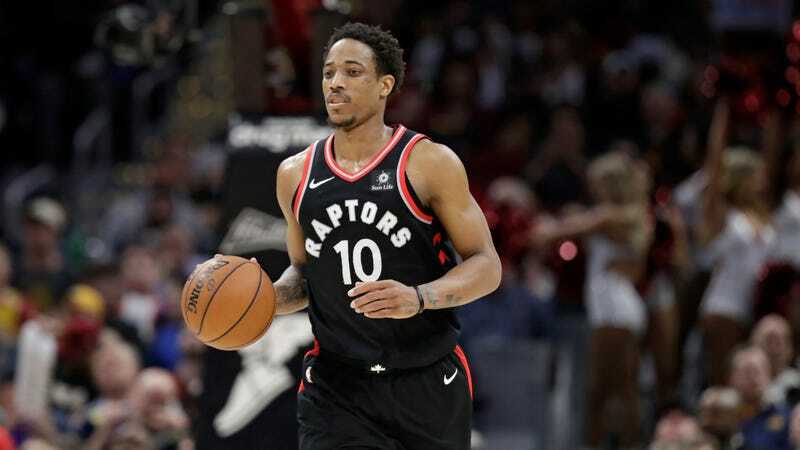 Carter hit a mere 33 percent of his shots that night and gave what seemed like a visibly lead-footed effort; the Raptors lost and were eliminated; and the affair tends to be remembered as a crucial point in the gradual souring of relations between Carter and the team. It remains a painful memory for Raptors fans, but they needn’t look 17 years into the past to find reasons to worry about an impending shameful collapse. Last spring can supply those. And the one before that. And the one before that. And the one before that. And the one before that. The Raptors will host the Celtics tonight, in Toronto, on under 24 hours’ rest; they’ll either push their lead in the race for the top playoff seed to a nigh-insurmountable three games with four left to play, or let it drop to one and spend the ensuing 48 hours pretending not to panic. The top seed won’t have to face LeBron James and the Cavaliers until the conference final; the second seed—if it advances past the first round, that is—will meet them a round earlier. For both teams, tonight’s meeting will have all the urgency and intensity of a playoff game. And if their history means anything, that’s a very bad sign for one of them.